The term, "ease" is very common in pattern instructions but do you understand the meaning? The meaning of ease is to bring or pull fabric fibers in to fit a smaller area without causing any puckers or gathers. One of the tell-tale signs of a "homemade garment" is to see puckers or gathers, especially in the sleeve cap of a garment. Learning the difference can mean the all the difference in a well-constructed garment. "What's the difference when a pattern calls for me to ease a fabric instead of saying to gather the fabric?" is a very common question. Both "ease" and "gather are very common sewing terms that may seem interchangeable until you know and understand the difference. Whether you are going to ease or to gather a fabric, the process begins with sewing basting stitches, in the seam allowance next to the seam line but basting stitches should remain in the seam allowance area of the fabric piece. Sewing two to three lines of stitching, leaving long tails of thread at the beginning and ending of your basting stitches and not backstitching, causes a much more even gather or easing process than one line of stitching. Always use quality thread when you are basting so that the thread does not break as you tug the thread to ease or gather the fabric. In the examples shown throughout this article, all of the samples started out at 7" wide. The lines of basting stitches were sewn with a 4.30 long stitch. The images will show the amount of change in the size of the edge being gathered or eased and how the shape of the fabric changes in these sewing processes. Easing involves bringing the threads of the fabric together without making any gathers or tucks. In the sample shown here, The fabric will still be smooth at the seam but it will start to take a shape of the eased edge. In the samples shown here, the top sample is just the three rows of basting stitched which did draw the fabric a small amount. The other sample has had the threads tugged to start the easing process and you can see how the edge of the fabric has started to change shape from the straight line it was at the beginning of the process. Although it is not very visible in the photo, the eased in sample also has a slight "puff" on the body of the fabric due to the easing. I suggest you find scraps of a relatively loosely woven fabric and sew the samples yourself and experiment with how much you pull in the basting threads to experience the change in the fabric with your own samples. Using a tightly woven sample of fabric can be more difficult to ease since the fibers of the fabric are already close together, making it difficult to experiment and understand the difference. When easing much less fabric will be drawn together than if you are gathering the fabric. In an area like setting in a sleeve, the sleeve itself will form a cap as the fabric is eased into the armseye of the garment. These stitched samples show how just sewing the basting stitches started to ease the fabric but once the threads were tugged to truly ease the fabric into an area, the easing changes the shape and size of the fabric. As the threads are eased together, the fabric no longer lays smoothly and flat on a surface and actually develops a dome or curve in the fabric, the same way the cap area of a sleeve takes shape. When you are gathering, the fabric can become very dense or slightly dense depending on how much fabric is drawn into the space it needs to fit in to and the weight or thickness of your fabric. No matter how much has to be gathered together, the fabric needs to be evenly distributed between the pattern markings. There should not be an un-gathered area in the area of gathered fabric. All of the fabric has to be evenly distributed so the gathers are even. There should not be a densely gathered area and a smooth area next to each other, within the gathered area that is between the markings. There can be un-gathered fabric at the end of a gathered section of fabric. At no time is the fabric folded or tucked to fit into the area. Puckered fabric and tucks will need you to remove the stitching carefully using a seam ripper and start the process again. Usually, the basting stitches can be preserved when you are removing construction stitches. If the basting stitches are broken, unlike mending a seam, remove the entire line of basting stitches and resew it so that the easing or gathering process can be done using a continuous line of basting stitches. 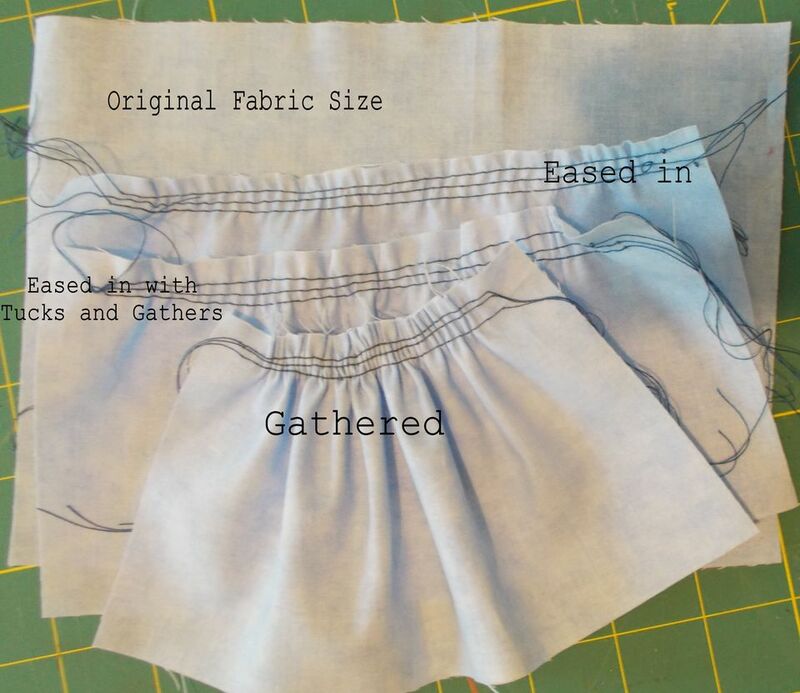 These examples of gathered fabric show how the gathers were not evenly distributed, leaving an area of smooth, flat fabric where the basting threads did not gather the fabric. If these uneven gathers were placed in a garment, they would stand out like a sore thumb. Although it takes time, it is best to evenly distribute the gathers so the finished appearance is even and professional.